Apples of Gold presents you with a red garnet and cubic zirconia match made in heaven with their "Only Us" two stone ring. The sterling silver ring is a true classic. Topped with a diamond cut garnet and cubic zirconia gemstones that measures 6mm with a total carat weight of 0.13 and is set by our jewelry experts, in a sterling silver band. 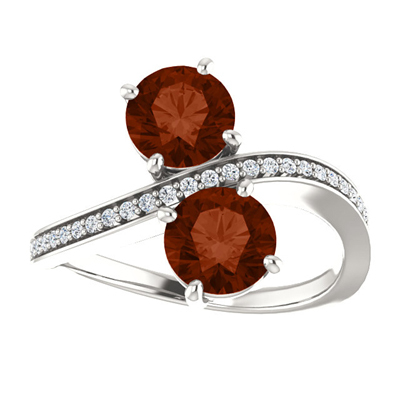 We guarantee our "Only Us" Garnet and CZ Two Stone Ring in Sterling Silver to be high quality, authentic jewelry, as described above.